PLASTICITY: First you have to understand plasticity. Everything you see, hear, smell, THINK, touch, creates a thread in your brain. And all these threads are linked together like a web. That is why when you smell a certain smell, you can recall certain memories. But what is interesting, is that the way we think, actually physically forms and shapes our brain. The way we use our brain actually reshapes and activates certain parts of our brain. MULTITASKING BEAST MODE! 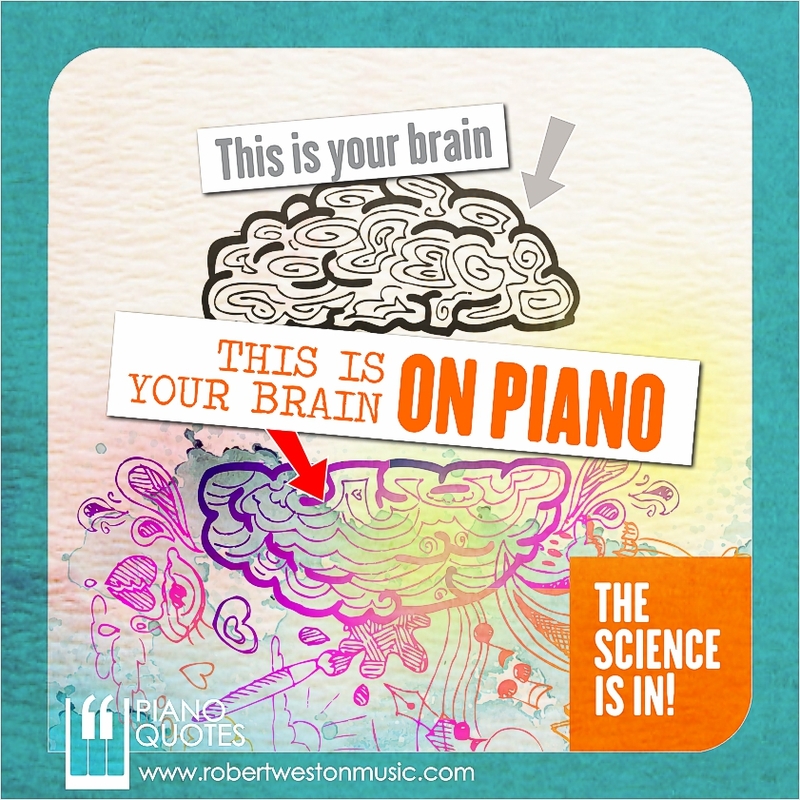 Evidence proves that music lessons of any kind helps focus and develop the brain, BUT PIANO IS ON A WHOLE OTHER LEVEL! Piano is the only instrument that can use all 10 fingers, 2 hands, 2 feet, 2 eyes, 2 ears. All of these senses, PLUS, it involves tempo, pitch and creativity over a span of 88 keys. Learning to see a sheet of music, play, and hear it, lights up every part of the brain. To manage all those options, pianists have to develop a totally unique brain capacity — one that has NOW been revealed by science. A MORE EVEN CENTRAL SULCUS – (That is a specific fold on both sides of your brain) It is innate in all of us, that these lobes are drastically uneven. This will indicate if we are right-handed or left-handed. A Pianist’s brain, however, proves to have more symmetrical central sulcus than everyone else. While this does not make a pianist ambidextrous per say, they do have more use of the non-dominate hand. Outside of piano, this gives a pianist rare ability to balance creativity (right brain) with logic and reasoning (left brain). FRONTAL LOBE CONNECTIVITY– Pianists have an extremely efficient connection between the other parts of the brain and the Frontal Lobe. That is important because of what all the Frontal Lobe handles: problem solving, language, spontaneity, decision making and social behavior. Consequently, piano players have a high speed integration system that helps them make complex decisions faster while being spontaneous and creative. A UNIQUE EXPRESSION – When a guitar player solos, they shut off the conscious part of their brain and activate their unconscious part of the brain. When a piano player solos, they shut off the part of the brain that provides stereotypical responses and activate the communication part of their brain. This allows them to play with their own unique voice or expression. More importantly, the pianist is using music as a literal language–expressing something with syntax instead of words. A MORE EFFICIENT BRAIN – While we have shown that the pianist brain is extremely active, another unique aspect of the pianist’s brain is that their brain requires less bloodflow to the part of the brain associated with fine motor skills–which means they need less energy to concentrate. This allows the brain more bloodflow to areas of the brain like communication and unique expression. So, as you can see the pianist brain is in fact very unique. Their skill at the piano gives them an advantage in areas of multitasking, communicating, decision making, concentration and creativity. Every instrument has its advantages and brain enhancing aspects, but piano is a great choice that can help individuals in life, work, music, and social behavior. “The Stand” – It’s not what I thought it was about.